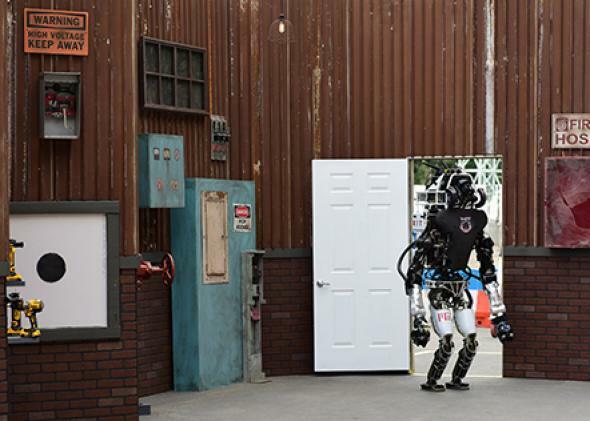 DARPA Robotics Challenge: Why we cheer for robots. Helios, an Atlas robot from a team at MIT, competes in the DARPA Robotics Challenge. That popular video of robots face-planting is, no question, hilarious. Yet if you attended the event from which the videos emerged, the pratfalls were as much poignant as comedic. Several thousand people in the stands of a horse track in Pomona, California, groaned when the robots—finalists in the U.S. Defense Advanced Research Projects Agency’s Robotics Challenge—fell or otherwise suffered mishaps. The audience members were feeling empathy for the machines and their human handlers. It was an extraordinary event, showing not just how robotics has come in a short time (and how far it has to go) but also how general attitudes are evolving. There was real money at stake, a total of $3.5 million (provided by taxpayers) for the top finishers in a challenge that saw robot/human teams accomplishing a series of—for robots—complex tasks. They had an hour to do such things as drive a vehicle (and get out of it), use a drill, pull a plug from one hole and put it in another, climb stairs, navigate through or around obstacles, and more. It’s fair to say, of course, that many of the teams spent more, perhaps much more, than the $2 million earned by the winning Team Kaist from South Korea, which had serious government, corporate, and university backing and put on a dazzling performance capped by the stair climb. What they achieved was remarkable by any standard—and all the more so if you’d seen semi-finals 18 months ago. At a Florida (auto) racetrack in December 2013, the robots were tethered, physically and electronically. In California, they were untethered. And DARPA’s Robotics Challenge program manager Gill Pratt said the tasks this time were at least 10 times more difficult, including the deliberate disruption of the wireless communications between the robots and their human partners. For a spectator, one of the biggest differences was the machines’ speed of movement. In 2013, reporters likened the “action” to watching paint dry. In 2015, Pratt suggested it was more like watching golf (“played underwater,” a journalist friend added). What had changed? The hardware was better, of course; the robots’ builders could cram more electronics, including processors, memory, and sensors, into less space. The programmers had learned a lot, too, and brought new sophistication into the coding inside the robots and on the computers operated by the human half of the partnership. The progress was stunning, as we’ve come to expect in our computing and communications. DARPA’s scenario for the robotics challenge was the aftermath of an event like the March 2011 earthquake and tsunami disaster that led to explosions, and ultimately meltdowns, at Japan’s Fukushima nuclear power facility. If robots had been able to open some safety valves soon enough in a radiation-exposed area that humans couldn’t enter, the meltdowns might have been averted. In interviews and public statements this year, Pratt and DARPA head Arati Prabhakar touted another obvious, and potentially profound, role for the robots in coming decades. They will become human companions, taking care of chores that we don’t want to do or, as we get older, may be physically unable to accomplish. Robots and the related technology of artificial intelligence will, of course, do much more than be good to us. As many have observed in recent years, they are going to handle countless jobs, eviscerating employment in any number of arenas. We’ve barely begun as a society to think through this latest economic revolution, and we’d better get started. Another elephant in the public policy room, meanwhile, was the reality of DARPA’s more deadly mission: to come up with advanced technology that can defeat enemies in a world where knowledge and talent don’t remain in one nation’s hands for very long. The “D” in DARPA stands for Defense, as in the Department of Defense, as in military. Practically any tool that will be useful for people will also be used against people. The robot that can open a door, drill through a wall, climb stairs, etc., can also carry a weapon—and use it. C-3PO can become a semi-autonomous Terminator. It would have been easy to imagine many of the Robotics Challenge contestants in the evil-robot category. They did not look cuddly at first glance. Yet the audience, which included hundreds of journalists from around the world, ended up rooting for the machines—or, at least, for the incredibly hard-working people who built them, programmed them, and tried to get them through the course. Maybe we transferred a bit of our admiration to the robots in the end.